Looking like a mix between good ol’ R2D2, a lamp and a golf ball, here comes the Robocco from Asahi. 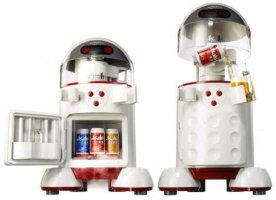 As you might have guessed from the title, this robot’s only task is related to beer: it should take one out of its belly, open it, and pour it in a mug. And this is what it does. Initially only available as a prize for a contest, it is now on sale at CScout Japan. It can hold a sixpack (of standard cans) in its refrigerating belly. At the press of a button, a can will be lifted, opened and poured into the mug. The whole operation will be accompanied by incessant nagging and lots of text on its display. Click on for some more data and for a video of it in action. The ‘used, but in perfect condition’ robots are available for $800 (add $100 for insured delivery). The price is steep, for a device that only does one thing (and it doesn’t even do it good), but think of how rare it is. You’ll see by the length of the video that it takes an eternity to get your beer poured. As if this wasn’t enough, the operation is accompanied by robot sounds, lights and that incessant voice.. And to top all of it, the beer will get a huge head. No, not good.. I’d rather see the beer launching fridge available for sale.